High-quality blend of whey concentrate, egg albumin! It is a complex preparation, supplemented by metabolic activators - L-carnitine and lecithin delivering choline and inositol. It also contains a set of appropriate vitamins and minerals. 63 loyalty points Your cart will total 63 points that can be converted into a voucher of 2,52 PLN. Protein System 80® - a high-protein powdered concentrate OLIMP 80 has been designed as a diet supplement for high-performance athletes, for persons performing intense physical exercise, and also for convalescents. It is particularly recommended for strength athletes, strength-endurance athletes and bodybuilders. OLIMP 80 ensures the optimum growth of muscle mass and strength through an increased delivery of high-quality protein. OLIMP 80 contains wholesome, easily digestible protein rich in essential amino acids, including branched chains, which ensures the positive nitrogen balance during training. It stimulates muscle protein anabolism, while inhibiting the catabolic reactions associated with the energy exercise. OLIMP 80 meets the highest requirements for high-protein products. It contains carefully selected components that make easily digestible and easily digestible combination. OLIMP 80 is a complex product, supplemented by metabolic activators - L-carnitine and lecithin delivering choline and inositol. It also contains a set of appropriate vitamins and minerals, including trace elements (chromium, selenium, molybdenum) in quantities ensuring the normal course of metabolic processes during vigorous physical exercise and increased intake and metabolism of proteins. 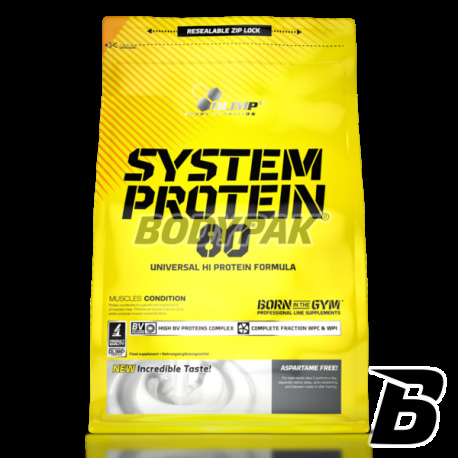 Suitable combinations of ultrafiltered whey proteins and egg proteins is an excellent product for everyday use as well as very good protein meal "before going to bed." 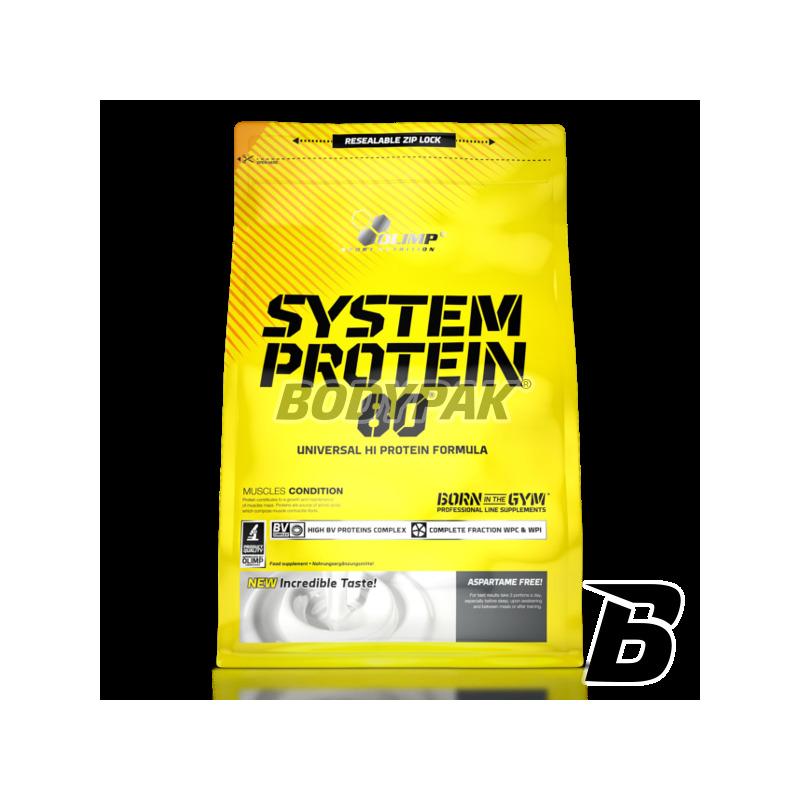 For people with increased energy and protein requirements, aiming in particular to the rapid development of mass, strength and muscle while reducing fat storage, mainly high-performance athletes and recreational athletes. When to use: in the morning on an empty stomach, between meals, after exercise, before bedtime. Składniki: 97% kompleks białkowy (koncentrat białek serwatkowych, ultrafiltrowane białko jaja), 1,5% kakao (dla smaków: czekoladowy, czekoladowo-miętowy, toffi), aromaty, kawa naturalna instant, aromaty, kawa zbożowa instant (dla smaków: kawowy, cappuccino), kwas jabłkowy - regulator kwasowości, lecytyna, guma ksantanowa – zagęstnik, chlorek potasu, acesulfam K, sukraloza - substancje słodzące, winian L-karnityny – substancja wzbogacająca, witaminy (kwas askorbinowy – wit.C, octan tokoferolu – wit. E, niacyna, biotyna, octan retinolu – wit. A, pantotenian wapnia, chlorowodorek pirydoksyny- wit. B6, cholekalcyferol – wit. D3, kwas foliowy, tiamina – wit. B1, ryboflawina – wit.B2, cyjanokobalamina – wit. B12), barwniki: E 129 (dla smaków: truskawkowy, truskawkowo-bananowy, czarna porzeczka, wiśniowy, malinowy), E 110 (dla smaków: pomarańczowy, wieloowocowy, jogurtowo-waniliowy), E 150c (dla smaków: toffi, kawowy, czekoladowy, czekoladowo-miętowy, orzecha laskowego i cappuccino), E 104 (dla smaków: bananowy, jogurtowo-cytrynowy i cytrynowy).